There are three reasons why the Melbourne Watch Company Portsea is the watch we’ve chosen to kick off Australian Watch Week. Firstly (and it’s important to get this out of the way early), home town bias – sorry rest of Australia, Melbourne rules. Secondly, Melbourne Watch Company is probably the most well known of the Australian Watch Brands on the international scene, partially because of the name but mainly because they’ve been very successful with their well-made designs. The final reason we’re starting off with the Portsea is because at the moment it sets the bar. It’s not a perfect watch, but as a complete package it’s hard to argue with. The Portsea is a watch in the deckwatch or marine chronometer style. The style comes from highly precise naval watches that were used as navigational tools. They are characterised by their clean design used to ensure maximum legibility and accuracy. 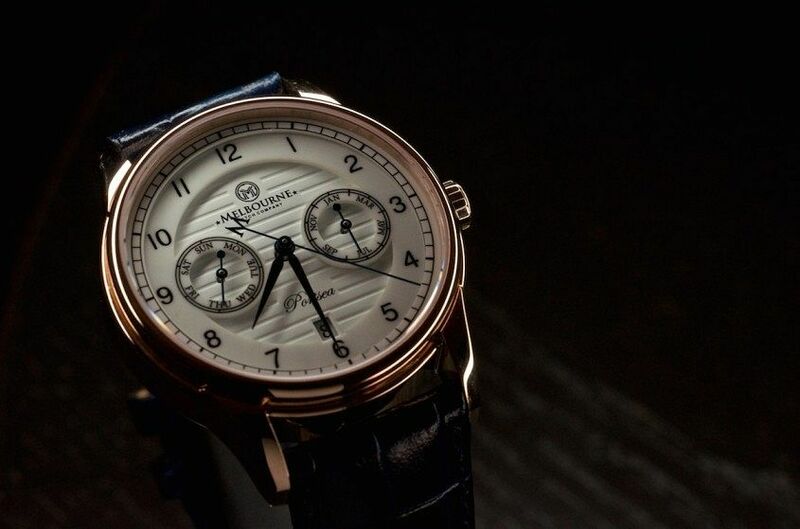 Perhaps the most famous example of this style is the IWC Portugieser. Surely it’s a coincidence that Portsea kind of sounds the same as Portugieser? It wouldn’t be a deliberate marketing ploy would it? The deckwatch inspiration is immediately obvious when you look at the dial, all the hallmarks are there; Arabic numerals, railroad style chapter ring and blued hands. But also present are a bunch of other nice details. Most obvious is that the subdials aren’t for a chronograph as you might expect, but rather the day and month subdials of a triple calendar complication (with a date window at 6). You don’t often see this level of complication on sub-$1000 kickstarter watches. The centre of the dial features deep horizontal ridges which add depth and richness. On top of this base dial sits a ceramic layer that comprises the Arabic hours, as well as the date subdials. This is a fairly technical dial construction, and the little details like the little detent for the date at 6 and the fact that the calendar dials are integrated shows that Sujain Krishnan, the man behind Melbourne has spent time getting this design right. And his investment has paid off. 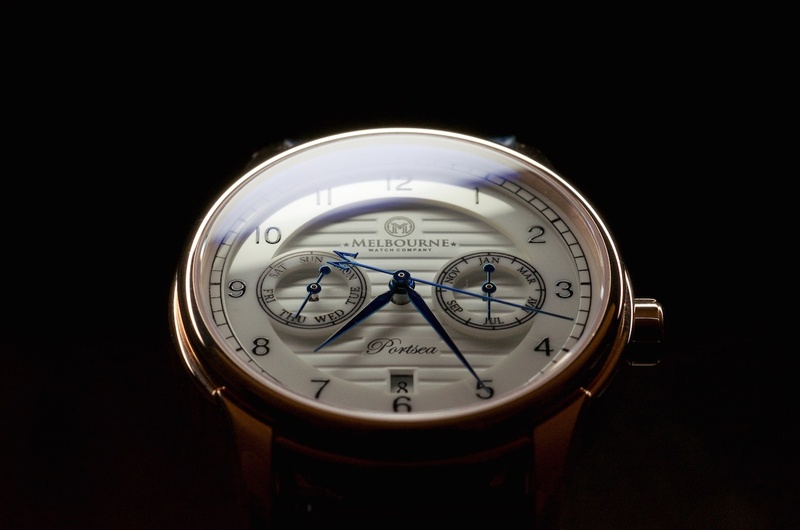 The dial of the Portsea is a thing of beauty in good light. Multilayered, textured and with a variety of finishes keep you looking at it for longer than strictly necessary to tell the time. The one thing that lets this dial down, and the only give-away that you’re not staring at a much more expensive watch is the quality of the printing – up close you can see the bleeding edges of the paint. However the Portsea isn’t a one trick pony. 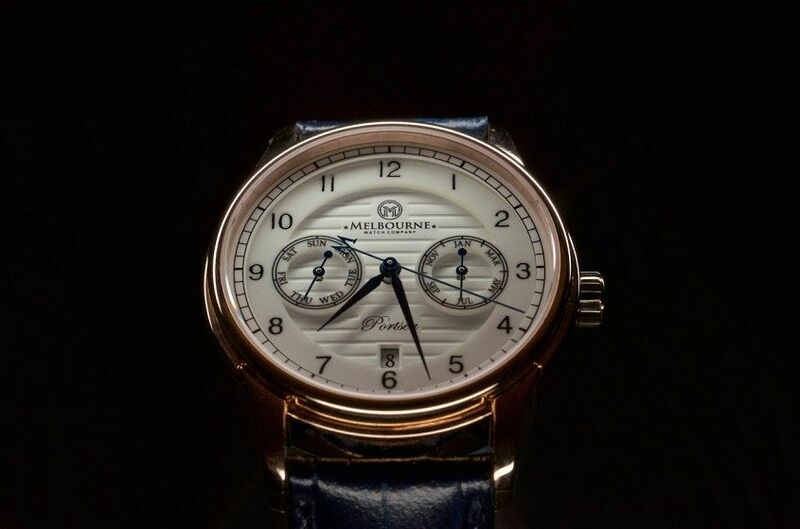 Melbourne have also put care into the design of the case, which on this model is a rose gold plate which is a cracking combo with the blue strap and white dial. The case style is quite formal, and well proportioned at 40mm across. It’s also rated to 100m which is a nice bit of extra security. Though we don’t suggest getting that nice German faux-croc strap wet. The caseback is a highlight as well, this level of detail and finish at this price is unexpected. 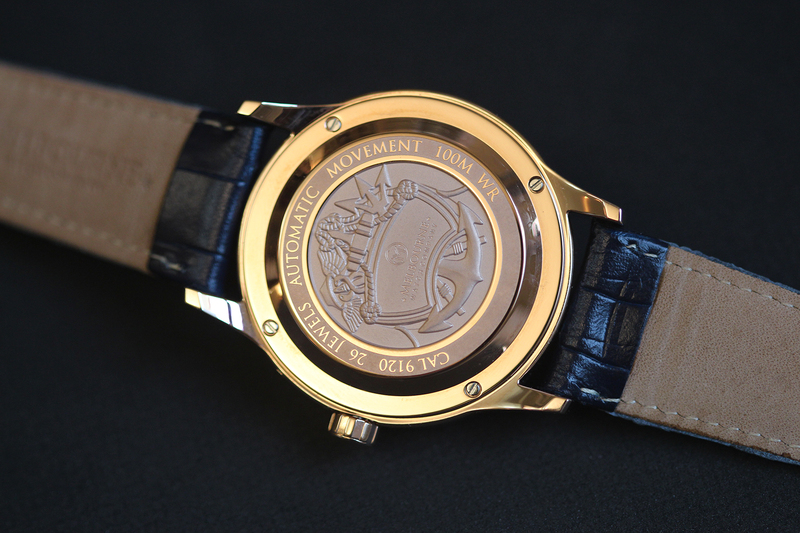 The caseback design itself is a little on the generic nautical/hipster side. This is hardly a major sin, and personally I think it’s a far nicer option than a display back showing the utilitarian finish of the Miyota movement. Speaking of Miyota, the Portsea is powered by the Cal 9120. This is an uncommon choice, but I think were going to see a lot more decent, asian made complications in the future. Essentially the 9120 is a calendar module on top of the 9015 that’s ubiquitous in watches of this price. The one notable features is the recessed pusher at 2 which will help you set the month without getting RSI from winding the crown. 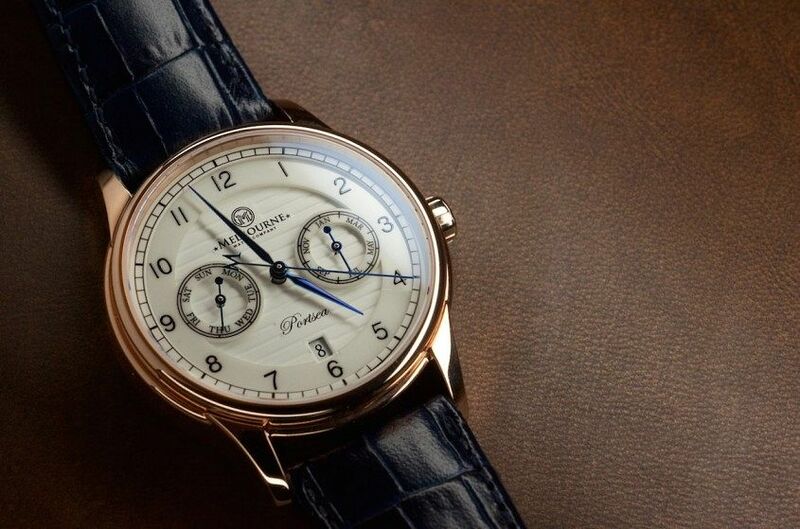 The steel Portsea models retail at $775, and the gold a little more at $799 (though it’s currently on pre-order sale), which is a very solid price for a watch of this fit and finish. 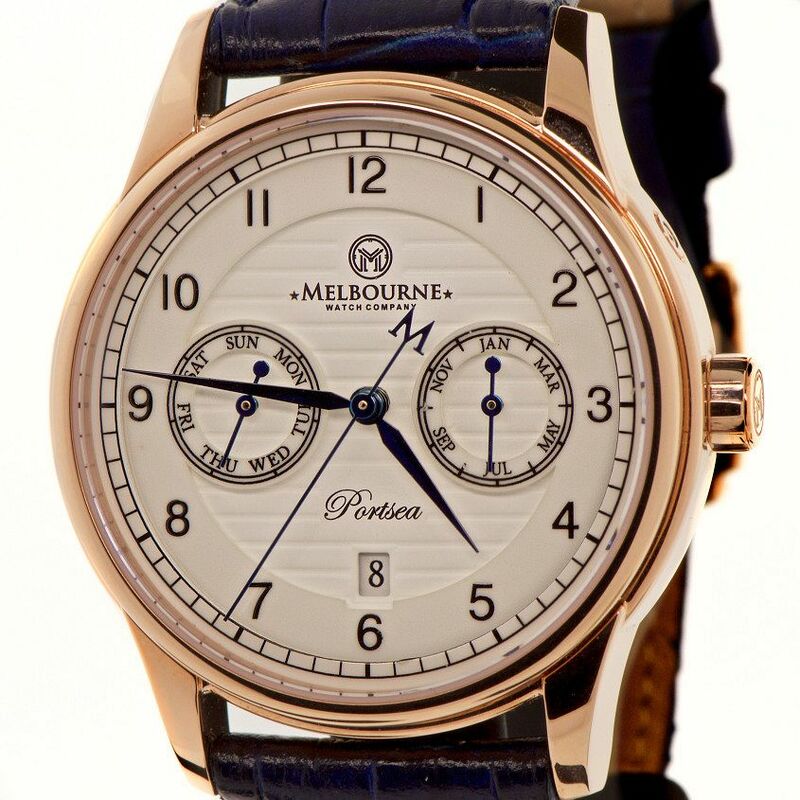 In fact, I’d go so far as to say that the Melbourne Watch Company Portsea is one of the best marriages of price, quality and design I’ve seen in a microbrand for a long time. If you’re spending that sort of money on an automatic watch you want something that looks good, is reliable, and offers a bit of a talking point. And while the Portsea meets all of these expectations it’s the dial of this watch, with its unique design and construction that really stands out, and really makes this watch worth the ticket price.